However, looking at the bigger picture, the development potential that could be realized in this Tripartite Agreement is immense. This partnership is also in tune with the unprecedented regional and global mega wealth creation trends underway. These countries all started in the 1950s and 60s as solid members in the western camp, but later started to hedge their bets with the Soviet Union as the best bidder in military support and also due to its affinity with new anti-colonial elites emerging from these countries. A clear example of this super-power competition is shown in the case of Berbera Port city. The port city’s strategic importance was utilized by the British even before fully occupying Somaliland “During the year 1890, an underwater cable was laid from Perim Island in the Gulf of Aden across to Berbera as part of a communication system linking England with Aden and beyond to India and Australia.”Later on Berbera housed the BBC East Africa Relay Station. At the height of the cold war era in the 1970s, Berbera became home to a major Soviet military base, but changed hands in the 1980s to serve as a US military facility, until the Somalia state collapsed. With the end of the cold war, and the onset of the era of mono-polar super power world order, the interest and international competition for the Horn of Africa waned. 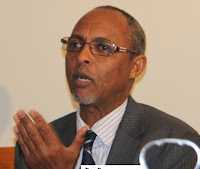 A new geo-political situation has also emerged in the Horn of Africa: Eritrea appeared on the scene after the break-up of Ethiopia, which rendered it a landlocked country after losing both the Red Sea port of Assab and Massawa. Somalia imploded, with Somaliland taking its own separate independence path, not yet recognized by any country, but with all intents and purposes, operating as a de facto sovereign state. The rest of the state of Somalia, after being in the doldrums for two decades with the exception of Puntland is now recovering into a Federal State system, with a weak Central Government and Regional States which in reality are their own masters and are able to carve their own powers within that federal system. At least 45% of the population of Somaliland is directly linked to livestock rearing for their livelihood, an economic sector which is extremely sensitive to climate change. The traditional production system of this sector is dependent on two diminishing resources: Rainfall and rangelands. Rainfall is much scantier than accustomed to and is increasingly unpredictable, so much so, that new concepts such as “el nino” and “la nina”, both global climatic conditions which are attributed to the severity of both droughts and floods, are now becoming mainstream in the local climatic vernacular. The last several years of consecutive droughts starting from western regions of Somaliland and wreaking havoc last year with devastating effects in eastern regions of Sanaag, Sool and Togdheer have established the realization that droughts are no longer one catastrophic event per so many years, but are here to stay with a maximum of one or two years’ reprieve. That changes the core rural production system of livestock dependence for livelihoods of close to half of the population and the national development strategy, which also plans on at least 29.5% of GDP contributed from livestock. The anecdotal evidence from the eastern regions, where living off of livestock economy dominated as the source of income and employment to a major part of the population, is that families owning 600 heads in Togdheer may end up with only around two dozen heads surviving from the last drought, and in Sanaag, with normal ownership of 1000 heads, survival of less than 10 percent. It is established beyond doubt that Khat consumption is the number one problem that Somaliland is faced with at present. It is detrimental to the society’s health, social life and economic wellbeing. However, there is a general feeling of helplessness on how to tackle it in a rational manner. None of the Somaliland Governments saw it as politically and practically feasible to challenge the status quo. Apart from the daunting task of facing the people to ask them to change such deep-rooted habit, governments themselves are hooked to it in several ways: fist due to its reliance on the substantial tax revenue accruing from it, which may amount to around 20% of the national budget (Jeffrey 2015); secondly governments do not see any easily available alternative source of sustenance for the thousands of the people that eke out a living from Khat business. Yet, the Government, the wider development oriented national elite and the international donor community have no justification for tolerating a drug that is recognised as the most potent driver of poverty in the Somaliland society. This can easily be demonstrated by simply factoring into the development process, the amount of hard currency spent yearly on chewing, as estimated by Hansen (2010) to be US$ 50 million annually, while in the same year the Somaliland Government’s budget was under US$50 million; similarly, Jeffery’s estimate in 2015 is slightly higher at US$ 52 million annually, which he sourced from the Somaliland Ministry of Finance. From all the contenders to develop the Berbera port, access to Ethiopia’s huge internal market and the business potential of its land locked status, added significant value to any deal to acquire Berbera. Ethiopia was not a passive bystander but was always considered as interested party number one by Somalilanders. However, as outlined in the literature, it lacked the financial and human resources muscle to go it alone in the mega-investments required to bring Berbera up to an international standard container handling port.In addition to resource paucity, it is argued that Ethiopia opted for an indirect strategy letting a third party take the lead role, to attain its aim to secure a stake in Berbera port of Somaliland; that is to save itself from answering the political implications of dealing directly with Somaliland, to be construed as recognition, something which it obviously is not prepared to do at this stage. Somaliland branded itself as the peaceful enclave and stable polity of the Somali region, most of which is plagued by conflict and instability. It warded off successfully the phenomena characterizing the Somali region, such as warlordism, Islamic fundamentalism, piracy and clan fiefdoms. These phenomena thwarted any efforts from most Somali regions to recover from the disastrous civil war and to form a stable central government or regional polities, with the exception of Puntland. Therefore, Somaliland developed growing security cooperation with Ethiopia which is mutually beneficial for both party’s development. While Somaliland benefitted from Ethiopian technical security support for training security personnel, intelligence sharing and overall support of its good offices, Somaliland represented a reliable safe border and friendly society for Ethiopia, acting in many ways as its buffer zone against destabilizing forces. Furthermore, the small but growing transit trade has continued so far without any security breaches or hindrances, establishing a healthy track record for a more robust unfettered inter-country trade. Kidist mulugeta July 2014, “The Role of Regional Powers in the Field of Peace and Security: The Case of Ethiopia, Freidrick Ebert Stiftung. http://library.fes.de/pdf-files/bueros/aethiopien/10879.pdf. Accessed July 5, 2018.